Sales needs marketing. Marketing needs sales. It’s an amazing relationship, but sometimes individual goals and siloed job functions put these two groups at odds. But, when both departments are working toward the same business goals, it’s such a great opportunity for these two groups to work together to achieve business goals together, but also help each other in other ways. So, we went to one of the experts in sales enablement, Pam Didner. Pam, author of Effective Sales Enablement: Achieve Sales Growth Through Collaborative Sales and Marketing, also has spoken at many CMI events including Content Marketing World and Intelligent Content Conference. We’re so glad we could spend an hour with Pam. 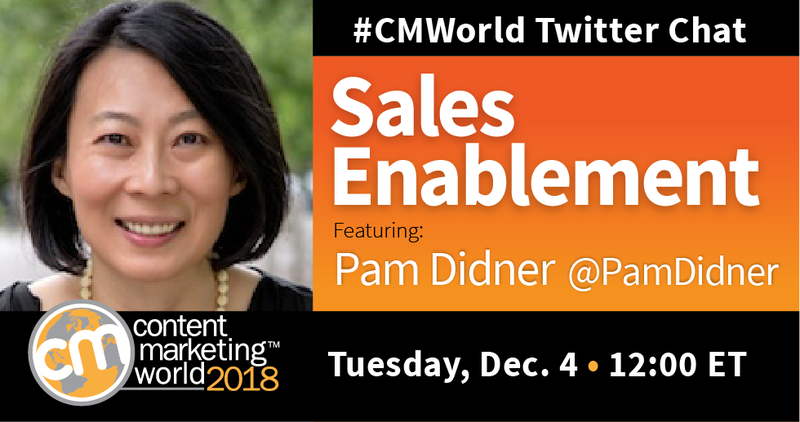 We had a great #CMWorld Twitter chat with Pam, and while it seems that we all know WHAT we should be doing from a sales and marketing collaboration standpoint, it seems that there’s a lot more work to be done. Two of the questions – and their responses – are highlighted below. For more tweets and responses from the discussion, check out our Twitter Moment. What are some tips you have for your sales and marketing teams? Let us know in the comments below. Would you like to learn more from our community members aside from our Tuesday gatherings on Twitter? Join us at Content Marketing World 2019! Registration is now open! We hope to see you next September in Cleveland!